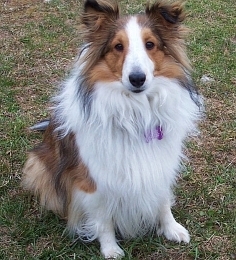 Here it is--time for my Shetland Sheepdog Fawna's 1st birthday. The puppy year has certainly gone by fast. 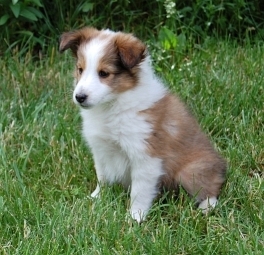 Just yesterday Fawna was a darling, tiny, compact ball of tan-and-white fluff, and now she is an almost grown-up dog. Recently I snapped some photos of Fawna while she was outside enjoying being with the other dogs in the family (a gentle older Sheltie named Mandy and an active Border Collie named Sheba). It was quite brisk and windy, and being in the far north of the U.S. even by May we don't have leaves on the trees yet. Fawna was dashing around chasing a ball and in the picture doesn't look exactly groomed, but she was happy. Fawna is amazingly smart and intuitive and a quick learner, especially when there is something in it for her. 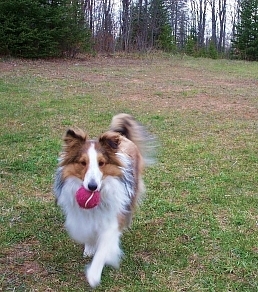 Of course all Shelties are incredibly intelligent, you know. That's just part of being a Sheltie. My Fawna has a wonderful and sweet--while energetic and adventuresome--personality. I am lucky to have such a best friend. Fawna is also very, very verbal. My husband says she has the mouth of six dogs. Fawna's hobbies are talking (barking), running down to the pond, sniffing outside, sleeping on the carpeted stairs (where she can maintain her lookout for action on both levels), growling at her plush animals while she is holding them hostage, licking my face, and assaulting the dust mop and broom. Her dislikes are the sound of rattling silverware, waiting endlessly for meals to be presented, and mom going out the door without inviting her to come along. At nightime, even very late, Fawna politely asks to go outside for a potty break (but really the secret reason is to assay the goings on around the perimeter of the house). We live in the country, and in the darkness and under the stars both Fawna and I wear lights illuminating our way. On my forehead I wear a Petzl Tikka Plus2 headlamp and Fawna wears a PupLight Dog Safety Light, both very bright. Our home is set 500 feet back from the road, and our closest neighbor can just barely be seen through the trees. I told the neighbor not to be alarmed if he happens to see two weird lights dancing in the night--it's merely Fawna and I out for a stroll. I have to wonder though if somebody passing in a car talks about the eerie, ghostly orbs that can on occassions be witnessed at night from the road. REMEMBER: Doggy Tales is Reader Contributed. If you have, or have had, a finned, feathered, or furry friend you were fortunate enough to share your life with, we want to hear about it! Leave a comment here with an addy where I can contact you, or click the FaceBook link on the right hand side and PM me. Your article will be featured in a future Monday segment. What a gorgeous dog! And the location of your home sounds so quiet and peaceful. I'm jealous. Fawna is such a pretty dog and sounds like a great companion. Your night walks are very interesting! Thanks for sharing. What a cute dog with an even cuter personality. You are blessed to have Fawna, as she is you. I saw a sheltie a few hours ago! They certainly are beautiful doggies :) Happy birthday to Fawna!